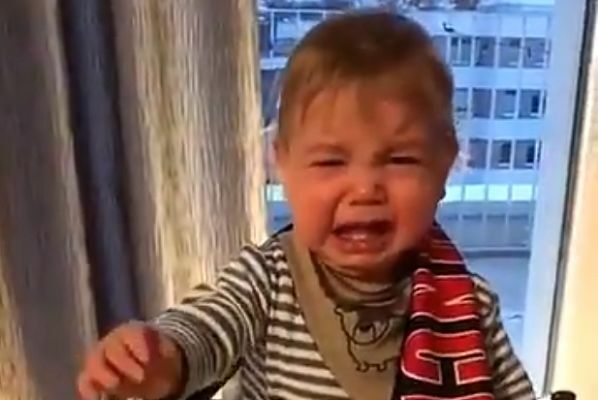 A baby boy was filmed bursting into tears when a man, presumably the child’s father, draped a Bayern Munich scarf over his shoulders. The youngster was sitting happily enough in his high chair when he suddenly had the Bayern scarf foisted on him. This clearly didn’t go down well, as he cries and wails loudly until the club merchandise is removed. In the accompanying tweet, it is humorously suggested that the infant is an Arsenal fan – but he’s unlikely to recall their 2017 Champions League round of 16 tie. Bundesliga giants Bayern registered a whopping 10-2 aggregate victory over Arsène Wenger’s Gunners, winning each leg by five goals to one. They also lost 5-1 to Bayern in their previous meeting before then, a group stage match at the Allianz Arena in 2015.